Your friendly neighborhood barstool experts. Barstool Comforts offers strong, comfy barstools and décor, friendly service, and free design advice. Founded in 2009, Barstool Comforts is based in Orlando, Florida. Our goal is to give you online shopping with an old-fashioned, personal touch. 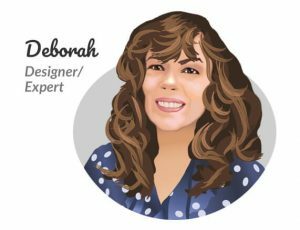 Hi there, I’m Deborah, Barstool Comforts’ interior designer. Joseph and I started working in furniture over 20 years ago. I did design, and he did customer service. We loved the work, so in 1999 we opened our furniture store: Dinette and Barstool Village. The store started small and has grown to house over 450 bar stools, plus dozens of tables, chairs and other pieces of home décor. Stephanie, a web developer, joined us in 2009 to start BarstoolComforts.com. We created Barstool Comforts to bring our design knowledge and the experience of friendly neighborhood service to the internet. We’re keen on making sure you’re a happy customer because that’s how we like to be treated when we go shopping. We only offer strong, well-crafted stools that we’ve quality tested in our showroom. Most of our stools are customizable and built to order. We also provide free interior design advice, just as we’ve always done in our store. If you have any questions about color, fabric, style — anything — I’m personally here to help you. You can call, email, and even send a picture of your interior and I’ll help you design your room. We triple-check every order to make sure you get the right products in your shipment. We believe in answering emails quickly and doing what we promise. We’re pretty old-fashioned when it comes to service. Oh, and we love to cook healthy dishes and have dinner parties! Durable, well-crafted barstools, and old-fashioned service! 24/7 online — we answer calls and emails between 9 a.m. and 6 p.m. Eastern, seven days a week. In 2003, Deborah lost her dear mother to the disease of ALS. She was unable to eat or drink because of her inability to swallow due to muscle deterioration and had to be fed through a tube. This dreadful disease currently has no cure. Because of this, we wanted to do something for the ALS Association to help them find a cure. We don’t want anyone to have to suffer as her mother did. We donate to the ALS Association a few times a year through Barstool Comforts. Click here to visit the ALS Association website. "Love my barstools, this is the second order I have placed, great quality and very sturdy. Also, I ordered several other barstools online before I found Barstool Comforts. The others were so cheaply made, there is no comparison to the quality of Barstool Comforts for the price." "As a Construction Engineer I can attest to the structural integrity of the stools I first saw and the ones I purchased. Fit and finish are perfect, nicely welded, even powdercoat, nice hardware, heavy vinyl, easy assembly. No issues. These are the best stools for the money." "Deborah is an awesome individual to work with in every way! She is responsive, attentive, keeps in touch, and lets you know what is going on with current specials if you haven't ordered yet! Honestly, I have worked with many representatives and she ranks among the top! If I could check every reason for buying, it was an excellent experience from beginning to end." "I found the Amisco Ronny barstool locally; however, there were a lot of complaints about the store. The customer service was not so good, so I looked online to see if I could purchase directly from the Amisco site. That's how I found your website. After calling you with a few questions, I felt more confident ordering from you than my local store. I love my barstools! (might be ordering another one). They were delivered earlier than expected and the quality is wonderful. Just what I wanted! Thank you." All joking aside, we applaud the very detailed packaging of the bar/counter stools. Your packing/shipping dept. made sure NOTHING was getting scratched or broken during shipment and it's very much appreciated. Over all, amazing company, superb customer service and phenomenal packing/shipping department. Highly recommend Barstool Comforts." "We had excellent service from Barstool Comforts. Damage occurred in the shipping of one of our stools and Deborah worked diligently with the vendor to see that we received replacement parts. Deborah was very responsive to our questions and concerns and we couldn't have had a better person with which to work - she was amazing. Thank you, Deborah!" "The Amisco barstools are very comfortable and solidly built. I couldn't be happier with them. They are quality products. Most importantly I have to thank Deborah. She is the most helpful person I've dealt with in all my internet shopping, and I use the internet for shopping extensively! Incredible service and generous with her time and knowledge. I can't thank her enough for making this purchase process easy and comfortable for me. As comfortable as the barstools themselves." "I learned of you through the stool manufacturer after having a big problem with an Amazon seller. The manufacturer endorsed you and that is how I came to order from you. Your prices were competitive, you took my calls immediately, your website is easy and you went the extra mile to determine that the manufacturer would make padded seats for their outdoor stools for me. I am thrilled with the product and your company. It was your easy website that won you more business - I didn't know the manufacturer made outdoor stools until I found them on your site. "Very satisfied with both the quality of the stools I purchased and also the customer service I received from Barstool Comforts. I had a problem with some defective parts and they resolved it with the manufacturer and got replacement parts sent to me, free of charge! Great company and would definitely buy from again!" "I purchased Amisco counter stools. I made the purchase based on the fact that they could be customized. They came quickly and are beautiful! Barstool Comforts were so easy to deal with. I would purchase again!" "Got the barstools and I am very pleased with them. I like them better than I thought I would. It's always a little scary when you just look at a small square of fabric and paint sample." "I love my Amisco barstools I purchased from Barstool Comforts. The website is user-friendly and the customer service was fantastic! I was concerned about the color selections so they were able to send me several samples to look at prior to purchase. They turned out perfectly and in great condition upon receiving them." "I can't wait to get my new stools! Once again, I really appreciate all the help from you and Deborah. Your prices are great! I checked your competitors and your prices are better, plus you have more options. And, your customer service is even better." "We have had two of these chairs for 8 years and they have shown no wear at all. When we built our new house, we wanted to match the chairs and were able to do this easily with the great customer service we received!" "Deborah was very knowledgeable about the barstools we chose and she took the time help us make the right decision. We received our barstools and they are exactly what we wanted, and the price was better than anywhere else. Very happy purchase!!" "What made me decide to buy from you? Good price, good knowledge of the product, friendly, helpful service, good website, good customizing options. I would highly recommend your expertise." "The barstool we ordered is exactly what we wanted and ordered. The options to customize the chair made ordering easy and easy to match our decor. We have an extra tall counter and thats why we ordered from Barstool comforts. They had the height that we needed and answered our questions promptly. We received updates throughout the process and received our chair on time. The chair was packed with care and put together in minutes. If you are looking for a great looking quality chair this is the place to purchase from. Thank you Barstool Comforts!" "I've had 2 identical barstools for over 10 years. They have been heavily used, but are in great shape and still very comfortable. People are shocked when I tell them how old they are. You can buy cheaper ones, but you are getting your money's worth and more with these!" "We love our bar stools. We saw them in someone else's home and went on line and found them. Your staff was very helpful and always answered our questions promptly." "You're at the top. What I needed wasn't available in the website. Your research allowed a special order to be successful." "Deborah, I love my new barstools. Thank you for being a great company with which to do business." "Exceptional service and quality stools! They are very responsive and answered all of questions. Must have spent at least 20 minutes on the phone going over the stools that we ordered to match our current stools. Their product knowledge is impressive! Our stools arrived, fully assembled and very well packaged. They are absolutely a perfect match! Honest, reliable and trustworthy company! "I can't believe it's been just over 2 weeks since we revised my original order, and the new barstools were delivered today! I just finished assembling them, and they are gorgeous!!! I can't thank you enough...it's been a real pleasure doing business with a company that's truly committed to customer service. I would definitely do business with you again, and will recommend Barstool Comforts without hesitation." "I just wanted to tell you that we loooooooooooove the barstools. They're peeeeeeeerfect!! OMG! They look so good in our house at the kitchen counter. The height is absolutely just right. Thank you so much for your inputs and advice on the color of the frames." "I have been pleased from start to finish. I have been kept in the loop along the way — when there would be a delay due to parts — when the items shipped etc. I could not be more pleased with my purchase. They are exactly as pictured on your site so there were no surprises when they arrived. They were easy to assemble and look great. I am very pleased and would definitely recommend to friends and will be back if I ever need barstools again. Thanks!" "I would like to acknowledge you and your company for great customer service. Many times we only hear when something is bad and I would like to thank you for the great service during our buying process and also with the defective seat. This was handled very well! Thanks again!" "Just wanted to tell you that I love love love my barstools! You did great on helping with the metal color & fabric!!" "The stools have arrived....and we are so pleased! My husband is putting them together right now. You did such a good job working with us, we certainly appreciate it." "We are extremely pleased with the quality and the customer service. Would definitely recommend your company. Thank you!" "I received customized personal service. When a product was back ordered, I got a personal email from Barstool Comforts, not a computer generated one, when the product was back in stock. I sent a request for a custom address used for the shipment, and again I received a personalized email confirming my request." "Appreciate your help getting replacement parts for our existing Trica barstools, plus adding new ones to match. Great communication and customer service." "I was extremely happy with our purchase and the service. There was a problem with the order so I had to call in and the people I spoke to were very helpful and promptly fixed my order." "Everyone was just great and helped me make the right purchase that I will be happy with for a long time. Great job for online sale of a custom order." "I was very pleased with how well you worked with me to try to get some new barstools and chairs after the last company that we had ordered from went out of business." 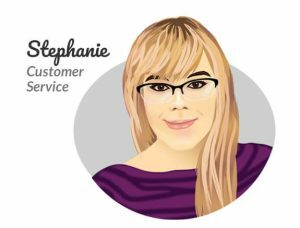 "Stephanie provided excelled customer service throughout the process (from sending sample fabric, to following up with delivery information)." "We were very pleased by your expert advice on our options and order. We just love them! No improvement needed!" "I had the Wonderful - Deborah - helping me! Great personal service, I ordered my own fabric, she made sure my beautiful bar stools were custom made with my fabric...We loved doing business with you, this was our 2nd time." "With Barstool Comforts, I experienced competence with respect to the customization of the barstools I purchased and additionally, excellent email and telephone communication and problem solving with respect to an issue I had with getting the barstools delivered to me by the date expected." "I just wanted to send a quick note to thank you for your assistance with the bar stools that I purchased through BarstoolComforts.com. We have had the stools for a little over a week now and can't believe how comfortable they are. My husband is 6'3" and my son is 6'5" so we wanted barstools that had some "substance" to them. I was afraid that the Callee Malibu stools that we ordered would look very square and boxy, but they are perfect for our family. I would recommend them for anyone, but especially for someone who likes a little extra room. They cannot be beat for comfort. Thank you again for your help and I will be sure to recommend BarstoolComforts to anyone looking for new bar stools." "The custom color and material choices, the quality and durability, and very good customer service all make this product great. The stools look and feel great." "Awesome! Very comfortable, shipped in 10 days everything in tact and packaged very well. I would tell anyone considering buying them not to hesitate in regards to this company we just moved into a new house nothing has gone off without a hitch except these stools sadly customer service is becoming none existent, with that said Thank you great product, great service very speedy delivery I would recommend to anyone." "We have this product or such a chair for about 13 years and these we purchased for our kids as they loved the look and the feel of them. So now it is in two households and two generations." "I found the chairs online and contacted Trica - they sent me to a nearby retailer. Service there was good, but the estimate was far more than Barstool Comforts. I would gladly recommend your products to all of my friends!!!" "The 2 Trica stools I bought are perfectly comfortable and feel as sturdy as the Trica set we bought many years ago. The website and support from Barstool Comforts was also excellent." Now that you know about us, we’d love to get to know you. We’re always eager to hear about your remodeling projects, what styles of décor you like, how you create a unique space—anything and everything interior design! Facebook and Google+ — Please stop by and say hi! We post all sorts of design inspiration. Houzz — Check out our past projects, idea books and more. Pinterest — View our pins from Seating Outfits to entertaining tips and more. YouTube — Watch bar stool assembly how-to’s, product walk-throughs, design tips and more. Send us a note with the form below. Thanks for reading and talk soon!